Sociologists and other scholars from around the world will travel to the ASA’s 105th Annual Meeting this August. Join your colleagues to hear top-notch speakers, network, and learn new research on current topics in the field. Choose from a wide selection of workshops and sessions. And see the largest exhibition of sociological products, publishers, and testing materials. Attendees will notice a greater emphasis on networking at the Annual Meeting. The meeting properties—Hilton Atlanta and the Atlanta Marriott Marquis—feature many public spaces with ample space for gathering with colleagues. The properties have been renovated and feature various quick dining options. Attendees will be able to take advantage of greater networking opportunities through expanded technology support. The meeting hotels will feature an ASA Cybercafé (each with 5-10 computer stations. Also look for signs onsite that will identify ASA supported "hot-spots" for Wireless Internet (WiFi) Access. These WiFi areas will feature complimentary access to ASA meeting attendees. 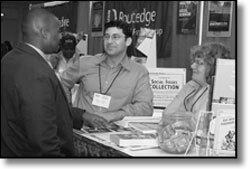 Attendees will be able to take advantage of greater networking opportunities at the Exhibit Hall in the Hilton Atlanta. The hall will feature an ASA Cybercafé; refreshment breaks; and the ASA Bookstore. These exhibit spaces will also bring a local flair to the Annual Meeting with the Atlanta Regional Marketplace, a gathering of local small businesses offering unique crafts and goods. The hall will have seating areas for gathering with colleagues. Location: Atlanta Marriott Marquis Find a former classmate at the Department Alumni Night reception. Signs will identify tables for participating colleges and universities. Enjoy cash bars stationed throughout the room. After the conclusion of the 2010 Presidential Address, all meeting attendees are invited to attend the reception and express appreciation and congratulations to President Evelyn Nakano Glenn and the major ASA award recipients.